A solar-powered traffic signal installed at the Aabpara intersection in Islamabad is helping manage traffic congestation. THOMSON REUTERS FOUNDATION/Saleem Shaikh. 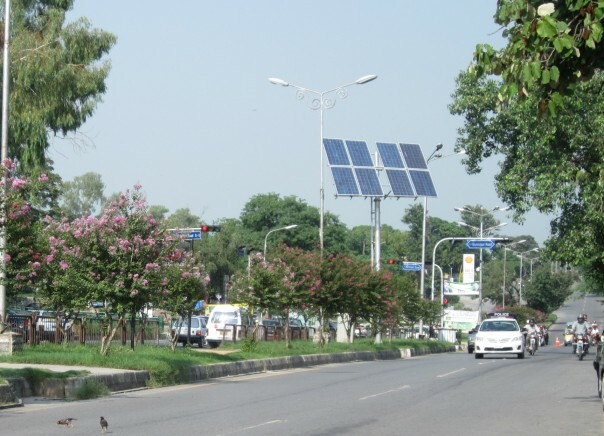 ISLAMABAD (Thomson Reuters Foundation) – Business has picked up for Abdul Latif, and he credits to an eco-innovation in Pakistan’s capital: the solar-powered traffic signal. Latif runs a shoe shop in Aabpara, a bustling main shopping area in an upscale sector of the heart of Islamabad. The traffic signal at the Aabpara intersection used to regularly fall dark because of frequent and protracted power failures, causing massive traffic jams on the road that passes by his shop. But the installation of solar-powered traffic signals has resolved the problem and business is now booming again, a happy Latif told the Thomson Reuters Foundation. Traffic jams on Islamabad’s main arteries and at intersections have become routine in the power-starved capital, which sees regular power outages, particularly when energy demand is high. Outages can lead to traffic signals going dark for hours, leading to massive traffic snarls. But in July, the city’s Capital Development Authority launched a pilot project to power traffic signals using solar panels. Solar-powered signals are now working at the Aabpara roundabout and at two other busy locations in the city. Officials at the Authority’s engineering wing said that if the pilot project is effective, the solar-powered signals would be installed at more intersections or roundabouts where traffic jams are a serious problem when the signals go dark. Navid Hassan Bokhari, director of solar energy affairs for the Pakistan Alternative Energy Development Board, said board had put together a plan to install solar panels at 25 traffic signals in Islamabad. Frustrated traders, fed-up drivers and exhausted traffic wardens welcomed the changes. “When traffic signals shut down during load-shedding hours, it is the wardens who have to handle vehicular traffic congestation for hours, said Bilal Raza, a 45-year-old traffic warden, standing beneath the solar-powered traffic signal at the Aabpara roundabout. The solar-powered signals are “helping us manage traffic jams that are a nightmare for us,” he said. Jacob Joseph, who runs a smartphone shop at the Jinnah Super market in another upscale residential and commercial sector, said he believed solar traffic signals could help manage business-destroying congestion at a range of shopping areas across the city. Hit by worsening power crises, the country’s other provinces, such as Sindh and Punjab, also are mulling installing solar traffic signals and street lights. Saeed Akhtar, chief engineer for Punjab province’s Traffic Engineering and Transport Planning Agency told Thomson Reuters Foundation over the telephone from Lahore that contracts have been signed with three local firms for the conversion of traffic signals to solar power at five road intersections in Lahore, the capital city of Punjab province. The costs of installing solar panels will be paid for by private firms in return for small advertisements at the signals, noting which firm had backed the project, he said. Akthar said his department is in touch with different potential corporate sponsors to fund installation and maintenance of solar panels at all 138 traffic signals. If the plan works, it “will help address our aggravating traffic mess without becoming any financial burden on the government’s pocket,” he maintained. Pakistan is grappled with one of the worst energy crises in its history, with around a 4,000-megawatt shortfall. Authorities hope that can be plugged by tapping into Pakistan’s huge solar energy potential. Right now, Pakistan uses only 7 megawatts of solar power, out of its estimated potential of 2.9 million megawatts, Gholamreza Zahedi, an associate professor of chemical engineering at Universiti Teknologi Malaysia, told Thomson Reuters Foundation in an email interview. He said that attracting local investments in small- and medium-size renewable energy plans and launching local manufacturing of basic components, with the help of European countries and China, which have more advanced renewable technology, could make a big difference in expanding Pakistan’s solar energy production. This entry was posted in Climate Change, Climate compatible development, Climate finance, Energy efficiency, Saleem Shaikh, Uncategorized and tagged Climate finance, energy crisis, Pakistan, Renewable energy, solar energy, solar technology by saleemshaikh. Bookmark the permalink.